WiringPi supports an extension module for the MCP23s08 (8-bit) and the MCP23s17 (16-bit) SPI GPIO expansion chips. pinBase is any number above 64 that doesn’t clash with any other wiringPi expansion module, spiPort is 0 or 1 for one of the two SPI ports on the Pi and devId is the ID of that MCP23x08 or MCP23s17 on the SPI port. You don’t need to specify the number of pins here as the MCP23s08 has 8 pins and the MCP23s17 has 16 pins. 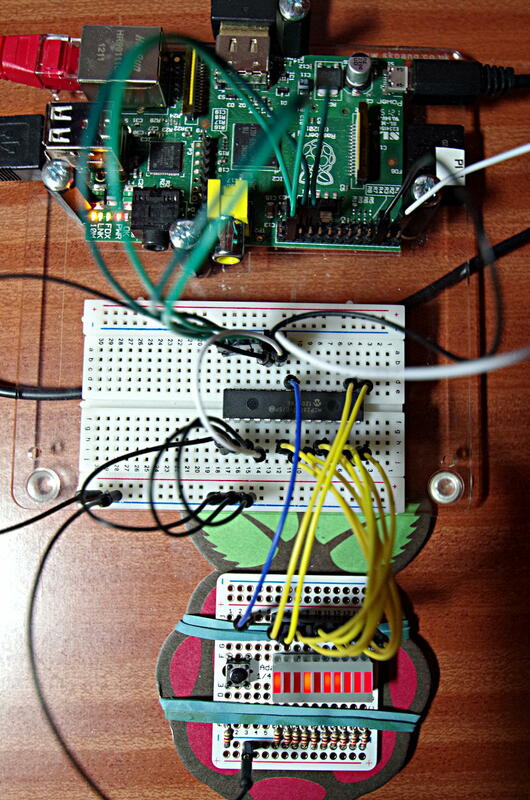 The following photo shows it in-use with an MCP23S17 on a breadboard connected to a Pi. The green wires are the SPI connections, then it’s just power and ground (white, black) The test board is connected to pins 0 through 11 and the button to pin 15 in the same way as the MCP23017 I2C example. Note the 3 black wires to the bottom-left. These are connecting the A0, A1 and A2 pins to 0v, giving a chip-id (devId) of 0. The MCP23s08 and MCP23s17 only have internal pull-up resistors, not pull-down. The maximum current sourced of sunk on any pin is 25mA, however the chip can only source a maxmum on 125mA or sink a maximum of 150mA. If you are using more than one chip, then you must make sure that each one has a unique devId (set by the A0, A1 and A2 pins on the chip), and initialise each one in-turn. Failure to do this will result in multiple chips working at the same time which is probably not what you want!